Above shows Milton Keynes shopping centre being constructed. Central Milton Keynes Shopping Centre is a regional shopping centre located in Milton Keynes Buckinghamshire, England which is about 50 miles north-west of London. It comprises two adjacent shopping lanes which are planted with sub-tropical and temperate trees and it is a grade II listed building. It opened on the 25th September 1979 by Margret Thatcher. The cool, elegant, steel framed design was influenced by Ludwig Mies Van der Rohewith glazed shopping streets or arcades on the grand scale of the Galleriain Milan. The designer, Derek Walker, also likened it to the Crystal Palace. It was described in 1993 as “still the best-looking if no longer the biggest shopping centre in the British Isles”. Milton Keynes Shopping mall was designed with the public access to all the shops is flush and at ground level. Some of the shops e.g. John Lewis, Debenhams and “Next” have 2 or 3 floors inside. A service road for deliveries runs above the shops, so that large trucks may service the shops at roof level, removing the peripheral service roads and loading bays at ground level that mark so many large shopping malls. This means all deliveries take place out of view of the shoppers. The internal landscaping was very lavish with 47 plant beds with large plants and trees; temperate in the northerly arcade and semi-tropical in the southerly one. The planters were finished in the same material as the floor, but approximately one third of these have been removed since the building was opened, with consequent loss of both planting and seating for shoppers, to accommodate market barrows and stalls extension in the centre. In 1993, the building was extended at the western end, over much of what had been City Square to the even greater length of 720 meters. Another extension was added called Midsummer Place and is effectively a southwards extension of the centre but is owned and operated independently. (It was a planning requirement that it should not physically attach to the original building, so there is an approximately one meter gap between them). Midsummer Place was designed by GMW Architects of London and opened in 2000. This extension is built across (and thus closing) Midsummer Boulevard using a (covered and enclosed) plaza that contains some demountable kiosks: it is a further planning requirement that the Boulevard should technically be capable of being reopened (remain free of structures) at some future date. The new centre was constructed in part around an existing oak tree that briefly survived being built around (at a 0.6 meters (2 ft) higher level) until it succumbed to ‘technical drowning’ (undrained flooding) from about 2008. Other artworks of special interest include: the market clock in Midsummer Arcade; ‘Dream Flight’, ‘Flying Carpet’ and ‘High Flyer’ (bronze figures) by Philomena Davis (1989), now located in Silbury Arcade; ‘Vox Pop’ (a group of cartoon-like bronze people) by John Clinch (1979) in Queen’s Court, ‘Bollards and Sundial’ (an outsize sundial with the solstice points marked), by Tim Minett (1979) was in storage awaiting reinstatement in the building; and a section of a C4 mosaic pavement from the nearby C4 Romano-British Bancroft Villa, mounted on a wall internally. 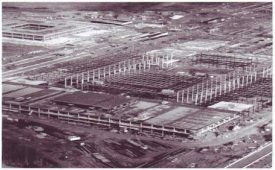 My family moved to Milton Keynes in the 1970’s as my father was an engineer and played a role in creating the new city, and this included the building of the shopping centre.